Marvin Hagler and Carlos Monzon can be said to be probably two of the very best Middleweight champions the world has ever seen. However some fight historians and boxing magazines I have been reading recently suggest Mickey Walker was probably the toughest and hardest hitting middleweight boxer of all time. He was nicknamed 'The Toy Bulldog', because of his non stop aggression and tenacity, yet only one of his eleven world title fights failed to go the distance. 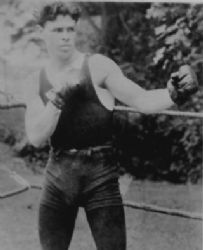 Edward Patrick 'Mickey' Walker was born on July 13, 1903, in New Jersey.His first professional fight was on February 10, 1919, when he fought Dominic Orsini, to a four round no decision in his home town of Elizabeth, New Jersey. He actually boxed in Elizabeth from his first to his eighteenth fight,then he ventured a few miles to Newark, but on April 29, 1919, be was beaten by a first round knock out by Phil Delmontt. In 1920 he fought twelve times winning two and participating in ten no decisions. In New Jersey at the time when Walker was boxing, it was the place where scoring systems had not be installed, therefore each fight that lasted the scheduled distance was automatically declared a no decision regardless of who had been the better boxer. He boxed sixteen times in 1921, winning six bouts and nine no decisions. In 1922 Walker went 3-4-4 before getting a world title shot.On November 1st 1922 Walker out pointed world welterweight champion Jack Britton over fifteen rounds to become champion.He had thirteen bouts in 1923 winning eleven of them,one no decision and one no contest. He defended the title against Pete Latzo and Jimmy Jones respectfully.In 1925, Walker went up in weight from welterweight to challenge Harry Greb for his middleweight world title belt and lost on points over fifteen rounds. He dropped back down to welterweight and defended his title over fifteen rounds on a points decision against David Shade.On May 20, 1926, he lost his welterweight title to Pete Latzo. Walker by now was in his mid twenties and it seemed he had physically matured out of the welterweight division.On November 20, he beat Jock Malone, and on December 3rd he beat Middleweight champion Tiger Flowers with a controversial ten round decision. He kept the Middleweight title for five years although he only defended it three times during that span. On March 28, 1929, he tried to become a member of that exclusive group of boxers who have been world champions in three different weight divisions however he failed in his attempt when he was defeated in a ten round decision to World Light Heavyweight champion Tommy Loughran. He then fought at Heavyweight on July 22, 1929 against former World Heavyweight Champion Jack Sharkey which ended in a fifteen round draw. Many people felt Walker was robbed in that fight. He fought Max Schmeling in 1932 losing by a eighth round KO. In 1933 he lost a fifteen round decision to Maxie Rosenbloom at Light Heavyweight. In 1934 he had a rematch with Rosenbloom and was awarded a decision win. He retired in 1935.After boxing he opened a restaurant in New York, and allegedly faced alcoholic problems after retiring..He became an accomplished artist many of his paintings ending up in New York and London art galleries.In 1974, Walker was found lying in the street in New York, he was taken to hospital, doctors thought at first he was just another run of the mill drunk, but after tests it was revealed that Mickey had Parkinsons disease, which would unfortunately claim his life in 1981. His record was quite awesome, ; Total fights 163 won 93 Losses 14 with 60 knock outs. 4 Draws, 46 No decisions and 1 No contest. His 60 Knock out wins makes him a member of the exclusive group of boxers who have 50 or more bouts won by knock out.